If I knew we could all make a lot of money. However, all past recessions were brought about by aggressive interest rate increases engineered by the Federal Reserve (Fed). What would cause the Fed to do this? Consumer spending would be hurt: cost of credit card borrowing, auto loans, home equity lines of credit and any other borrowing tied to variable rates would increase. Housing and business investment would slow: cost of mortgages and business investment would rise as bond investors demand higher rates to buy treasury bonds. Latest inflation reading for November showed prices rising at 1.5%, less than the Fed’s 2% target. Rate Increases and the Stock Market. History has shown that increases in the ten-year rate from its current 2.5% to about 5% have coincided with stock market advances as this is evidence of a strengthening economy. However, increases in the ten-year rate beyond 5% have historically been negative for the stock market. 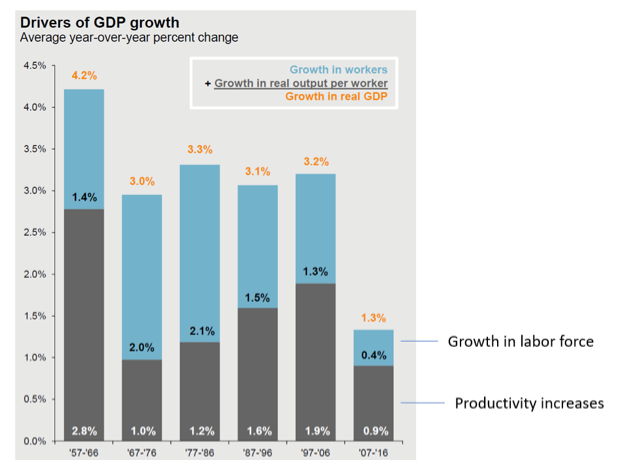 Is there Room to Run in the Current Recovery? Short answer: Yes, if it is not snubbed out by the Fed. 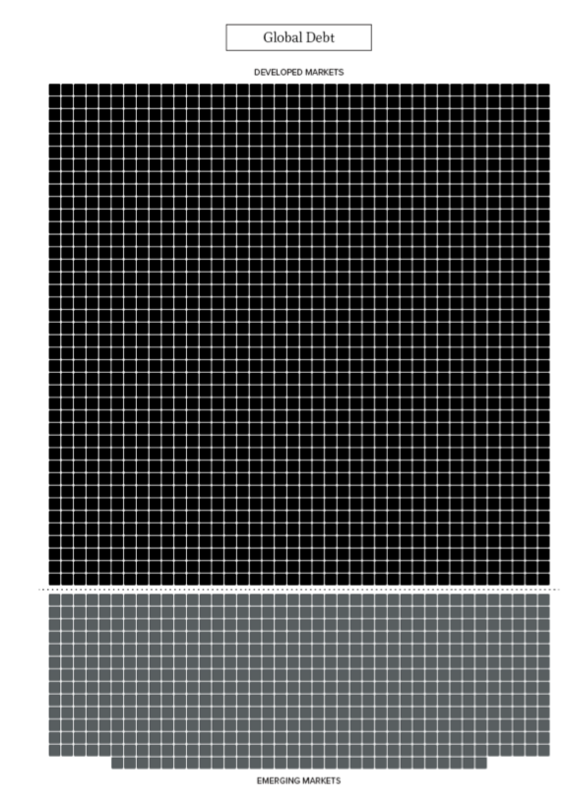 The current expansion is approaching nine years making it one of the longest on record. Employers bid up wages to find workers. Wage increases give rise to price increases producing “wage-price” inflation, triggering the negative consequences from the Fed cited above. •For a variety of reasons wage-price inflation has not occurred in the current expansion. 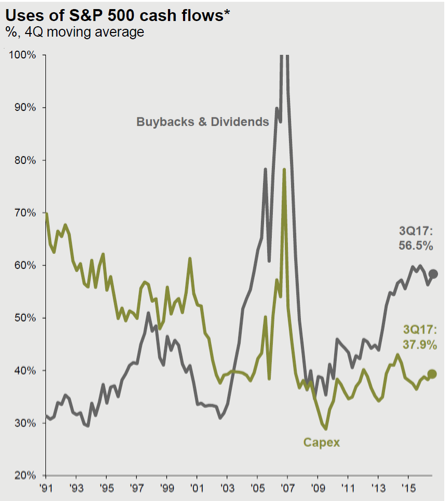 One of the reasons cited for the low growth has been lower than normal fixed investment (capital expenditures or Capex) by business. 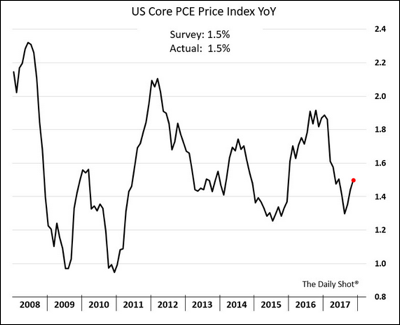 Therefore, while the current expansion has been long it has not been strong making it less prone to being “nipped in the bud” from higher inflation. While no one knows whether the new tax legislation will be successful in stimulating growth, one of its aims is to create incentives for business to invest more, increasing productivity and hence more rapid GDP growth. Two of the main incentives are lower corporate taxes and immediate expensing of capital investments. Both are aimed at increasing the after-tax return on investments. Businesses evaluate investment decisions by comparing the cost of the investment, i.e. interest rate on borrowed funds to the after-tax return on the investment. If this legislation does increase the after-tax return, then more investment should be forthcoming. 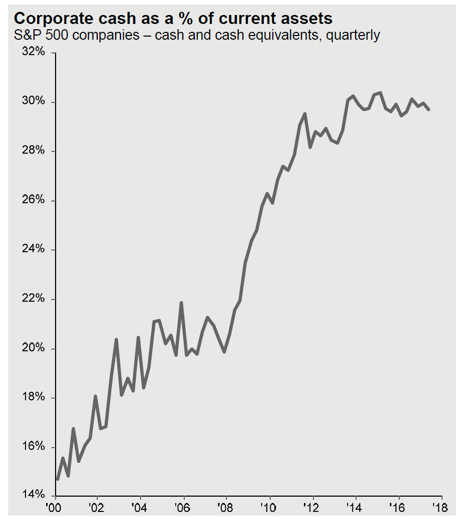 Company profitability has been extraordinary high over the past years. While companies certainly have had the means to make these investments, the incentives have been lacking; this legislation aims to provide the incentives. 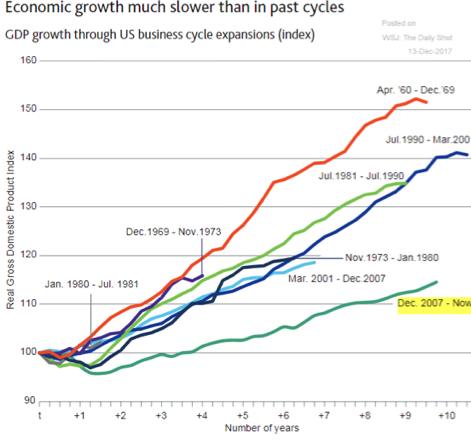 If business investment increases without causing runaway inflation, then yes, the current expansion can continue. At current prices the value of the world’s gold is about $7.7 trillion. 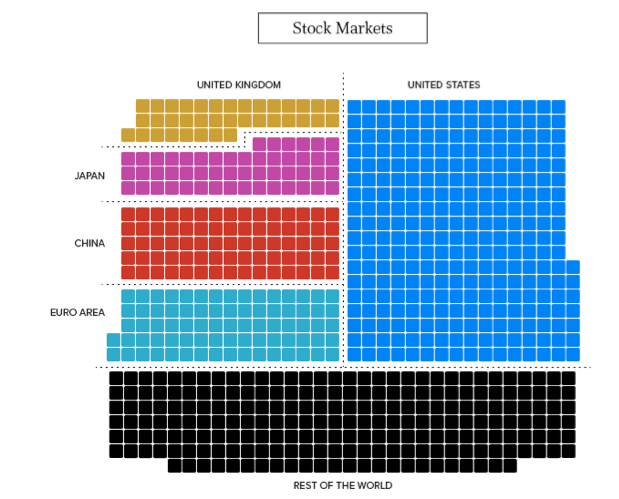 The current value of the world’s stock markets is roughly $73 trillion; the U.S. accounts for 38%. Debt incurred by governments, corporations and households is about $215 trillion or roughly 325% of global gross domestic product. Thirty-three percent of global debt was added in the last decade alone – largely attributable to the U.S. and China. 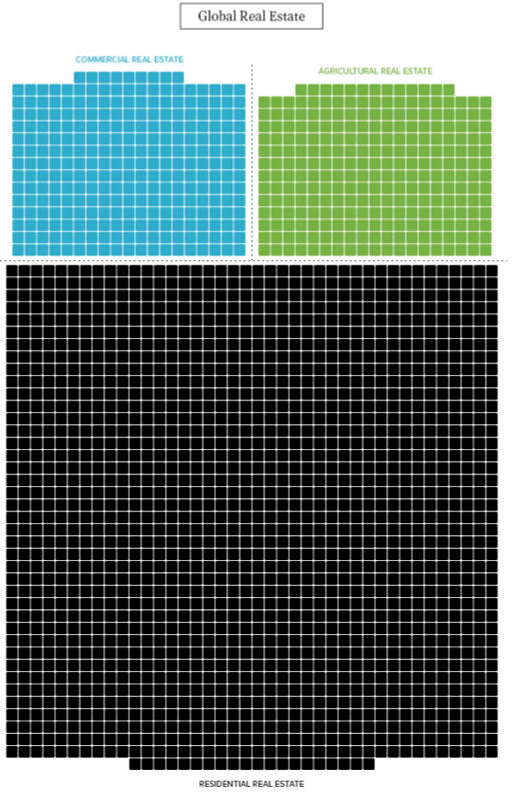 The estimated value of global real estate is $217 trillion. North America accounts for 21% of residential real estate value despite having only 5% of the world’s population.